Vermiculite G is an aluminium-iron-magnesium-silicate which belongs to the mica group of minerals. It contains lots of valuable minerals and supplies plants with trace elements, especially with iron, silicon and magnesium. 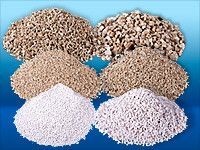 Vermiculite G is an accordion-like granulate with millions of tiny layers of air in which water and especially nutrient ions can be stored (up to 600%) and given to the plant roots as required (exchanging ions). Vermiculite G as a substrate in containers (plastic sacks, tray etc.) Filled and supplied with the controlled nutrient and solution is suitable for plant cultures in any types of soil (hydroculture).